The new Mercy Hospital was scheduled to open July 2013, but was delayed due to extensive damage from an EF5 tornado that hit Oklahoma City on May 19, 2013. After assessing the damage, the estimated completion date was been pushed back to late summer of 2014. The building sustained structural damage including roof, windows and interior walls. Included in the 206,000 sq. 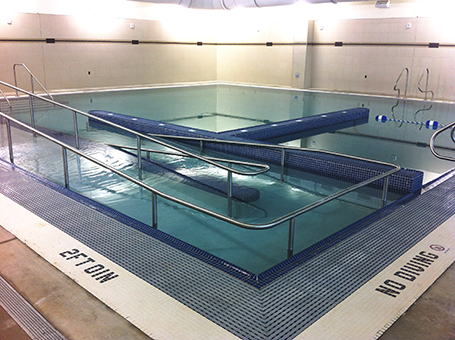 ft. fitness center is an aquatics area complete with an exercise pool, warm water therapy pool, lap pool and whirlpool, as well as an indoor walking/jogging track. This facility is the first in the nation to include a wellness center capable of tracking workout and rehab efforts via a patient’s electronic health record, creating accountability between patient and medical team.